3 strand 8mm glass pearls and natural shell slices with earrings and bracelet. A silver box clasp holds three strands of pink 8mm glass pearls with clusters of natural shell slices, almost floral in appearance. Complementary 3"pearl and shell earrings on french wires and three strand stretch bracelet. 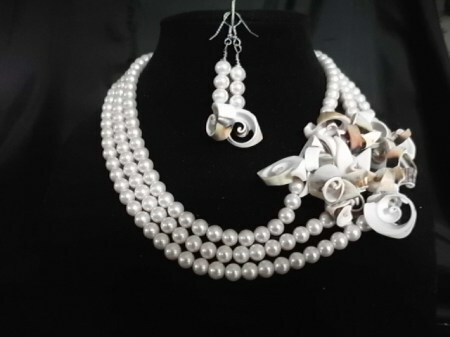 Not your ordinary pearl necklace set.